Russian, Iranian presidents meet on sidelines of Caspian Summit, praise their work to ensure Assad's victory in Syria. Russian President Vladimir Putin met Sunday with his Iranian counterpart, Hassan Rouhani. The meeting took place on the sidelines of the Caspian Summit. Putin said that the Syrian civil war would be high on the list of priorities during their meeting. "There is much cooperation between our countries. We have many issues to address regarding the world’s acute crises, including that in Syria. I would like to inform you about the progress of our contacts with our partners on this complicated problem," Putin said. 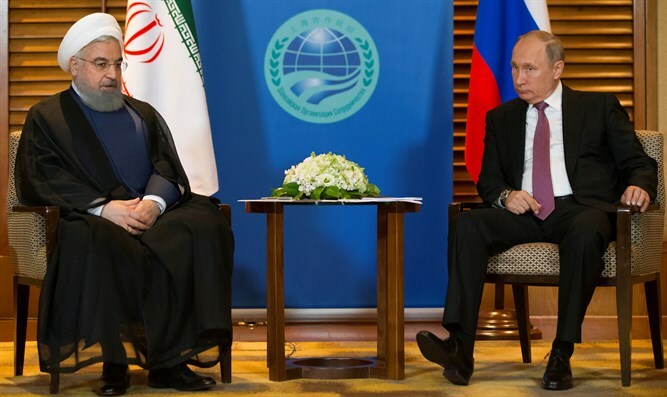 Rouhani said that he looked forward to discussing with Putin "fighting terrorism and bringing stability to the region. "Our common goal is to establish stability and peace in the whole region and provide security for the region’s countries. The world has witnessed how, with the help from Iran and Russia, the Syrian army was able to play a vital role in fighting terrorism in Syria. Rouhani said that Iran was working together with Russia and Turkey to resolve conflicts in the Middle East. "I must emphasize that today all measures being taken by Iran, Russia and Turkey are helping to establish peace and security in the Syrian Arab Republic." "In the recent years, we have reached two important achievements. The first one is cooperation between Iran, Russia and other countries in achieving agreements on the Iranian Nuclear Deal. The second one is how Iran, Russia and Turkey cooperate in establishing peace and security in Syria."